The Alto had always been an experimental prototype. The project of a commercial system that builds on top of all the research results of PARC started in 1975 and led to the development of the Xerox 8010 Information System. The Xerox Star (cf. 3.1.6), as this system was called for short, was presented in 1981. It introduced a consistent graphical user interface that covers the operational tasks of the computer with the notion of an office environment. The desktop metaphor was born, although it was originally called the physical-office metaphor. Development of the Star started in 1975. It was Xerox’ intention to exploit the scientific results of Xerox PARC to produce and market a personal computer for office application. 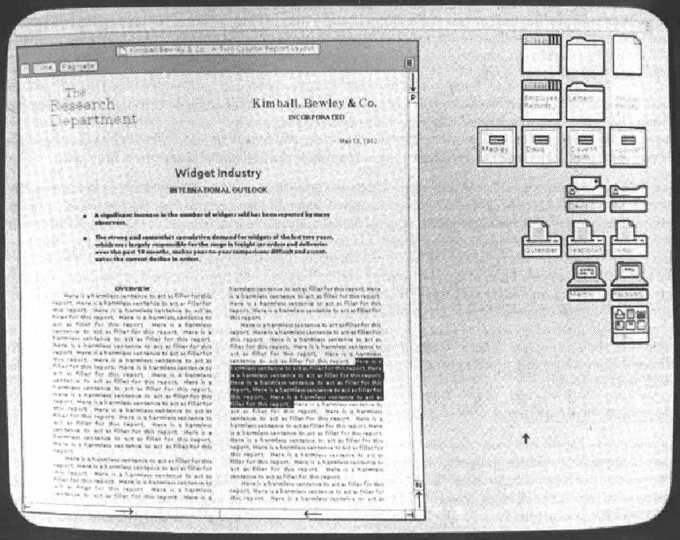 The Star workstation is presented in April 1981 as the Xerox 8010 Information System. The hardware architecture is an improved version of the Alto computer. The paper Designing the Star User Interface [Smith et al. 82] by David C. Smith, Charles Irby, Ralph Kimball, William Verplank, and Eric Harslem mentions that the typical memory configuration is 512 KB RAM and a harddrive with 10 MB capacity, optionally 29 MB. The Star has Ethernet built-in to connect the computer to a local areal network with access to a laser printer, shared file servers and other Star workstations. The Star is equipped with a much larger screen than the Alto. The bit-mapped, black and white 17" screen can display 1024 by 808 pixels at 72 DPI. A mouse with two buttons is attached as graphical pointing device. In order to reduce complexity this is one button less than Alto’s mouse has. For the same reason the five-finger chording keyset is no longer an option. But the keyboard is extended by a moderate number of function keys to the left, right and top. Star’s interface team presumed that an integrated system would be much better suited for an office environment than the current software situation at Xerox PARC. Many application programs like Bravo for WYSIWYG text layout or Draw for illustrations are impressive if they are evaluated one by one. But they lack a common approach in interface design. Each program employs a different set of interaction techniques. Alan Kay has demonstrated how the dilemma of preemption can be solved for the Smalltalk environment. But several programs are based on different programming languages and cannot make use of overlapping windows. In order to gain a better understanding of the real situation of their target audience the interface team arranges several site visits at business offices. User studies and task analysis become for the first time an official part of a development process. Some early results from 1976 are published by William Newman and Timothy Mott in Officetalk-Zero: An Experimental Integrated Office System [Newman/Mott 82]. Typical tasks include document editing, page layout and illustration. Documents like memos, presentations and letters are filed into folders and retrieved on demand. Personal records are processed. Electronic mail is also an office task of growing importance. The insights are used to develop the prototype Officetalk-Zero. It is field-tested extensively at Parc and at other Xerox departments outside the laboratory in 1978. One of the results of the Officetalk studies indicate difficulties with overlapping windows. Users seem to waste too much time adjusting size and position of windows [Ibid., p 329]. This leads to the design decision to use non-overlapping windows for the Star interface. The only exception will be property sheets, that are – similar to modal dialogs nowadays – only displayed for a short period of time. Fig. 3.9 Xerox Star, 1981. A document window with layout using multiple fonts. On the Desktop are icons representing a record, a folder and a document (first row). The third icon in the second row without a frame is the open icon for the document window. It is followed by four file drawer icons, then electronic mail – in and out, three printers, two terminals, and finally a directory of a remote network. The white bar on top is a status bar – it shouldn’t be considered as a menu bar. Analogical representations suggest operations to try, and it is likely that operations applied to analogical representations would be legal in the other context, and vice versa. This is the philosophical basis for the design of the Xerox Star and, ultimately, Apple Macintosh “desktop” user interfaces; they are a metaphor for the physical office […]. Being able to put documents in folders in a physical office suggests that one ought to be able to put document icons in folder icons in the computer “desktop,” and in fact one can. To interact with the system the Star interface offers a reduced set of commands, that is MOVE, COPY, OPEN, DELETE, SHOW PROPERTIES, COPY PROPERTIES, AGAIN, UNDO, and HELP [Smith et al. 82, p. 307], [Friedewald 99, p. 346]. These commands are permanently assigned to function keys on the keyboard. They are sufficient to operate all aspects of the system, because they are used in a generic fashion. For example, if the user wants to file a document into a folder, she has to select the corresponding document icon with a single click, and has to press the function key MOVE. The next click on a folder icon determines the target folder and moves the document. If she wants to print the document, she has to use the MOVE command once again. But the next click on a printer icon activates in this case the printing process of the document. The limited set of generic commands avoids the complex command structure of other programs. Together with the relation between icons and terminology to the physical office environment it helps the user to build a conceptual model of the system. This model is referred to as the physical-office metaphor, or the desktop metaphor. It turns out to be essential especially for casual users, because its consistency allows to draw analogical assumptions that are in fact valid operations in the context of the environment. A deep technical understanding of a computer is no longer necessary to use a computer.